If you're looking for a small, easily accessible island retreat, Treasure Island can be just the idyllic South Pacific island you dreamed of. 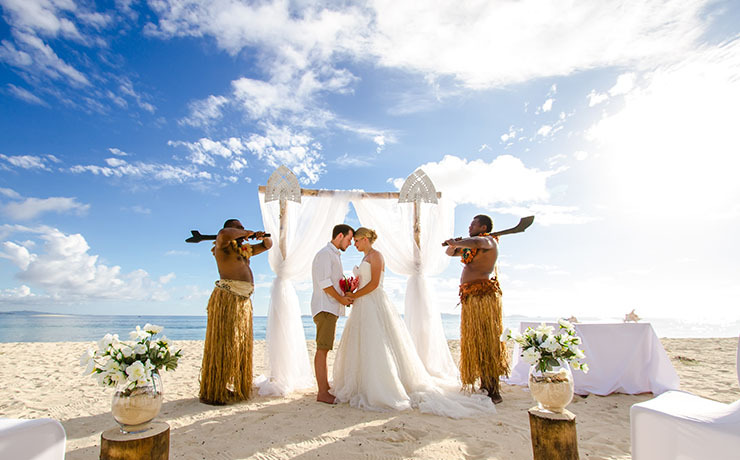 The white sand beaches, lush tropical gardens, ocean view bures and Treasures famous Fijian hospitality offer a haven for couples and families from all over the world. 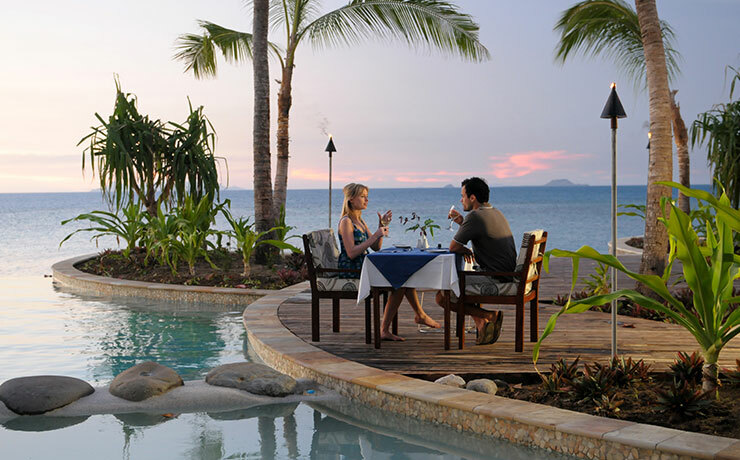 Unlike most other Fijian island resorts, we encompass the entire island of almost 6 hectares. 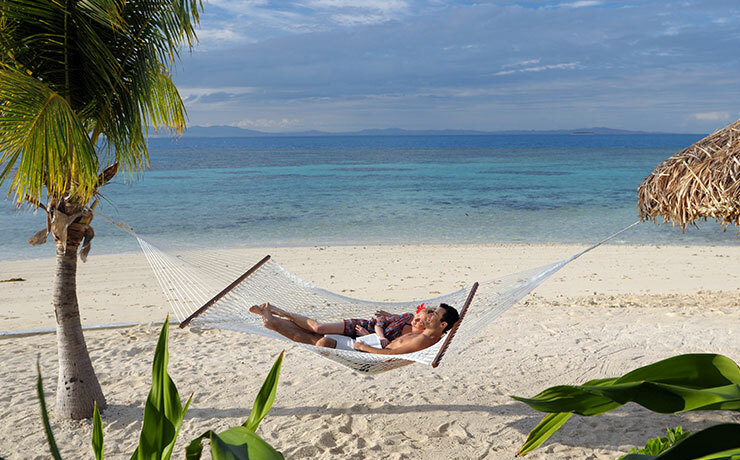 Set on a coral- and sand-fringed atoll within a stunning marine sanctuary, Treasure Island is one of Fiji's most iconic resorts, with 35 years experience in providing hospitality and friendship to travellers from across the globe. 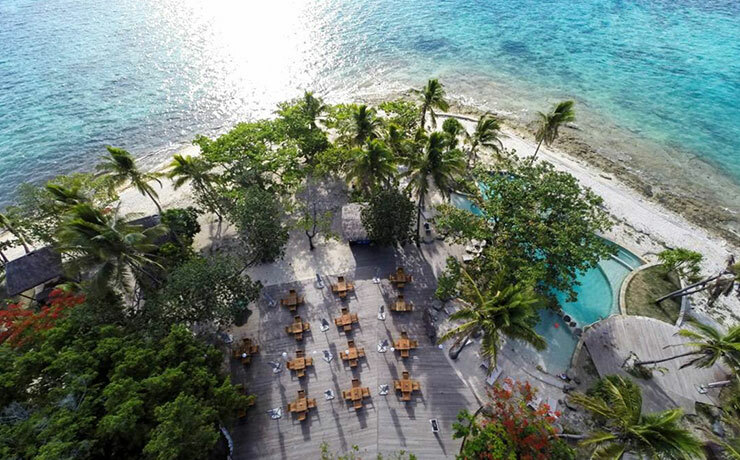 The island caters especially to honeymooners, families and true romantics seeking a unique and unforgettable four-star island holiday experience. At Treasure Island we ensure that you will receive a truly authentic Fijian experience with our traditional land owners, the Nakelo Clan, owning 50% of the resort and holding many key positions. Importantly, we are one of the only resorts in the Mamanuca Islands to offer same day transfers, which means that you arrive on our island paradise the same day you arrive in Fiji. Why don't you come experience for yourself what is unique and special about our island paradise. 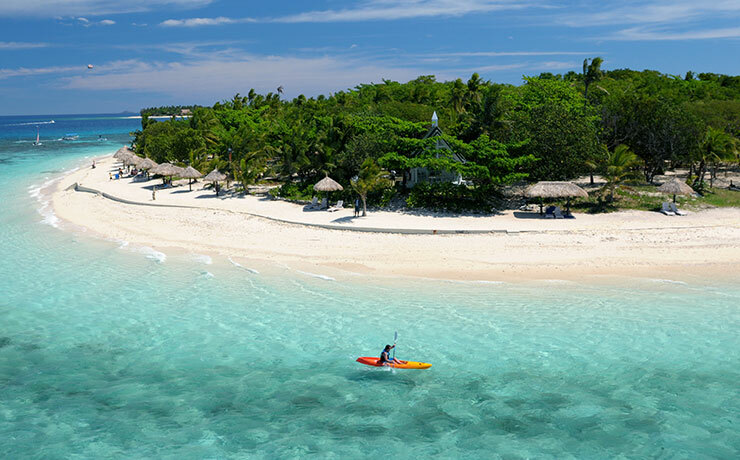 Easily accessible from the main Fijian island of Viti Levu, Treasure Island sits within the breathtaking Mamanuca Island group, east of Nadi. 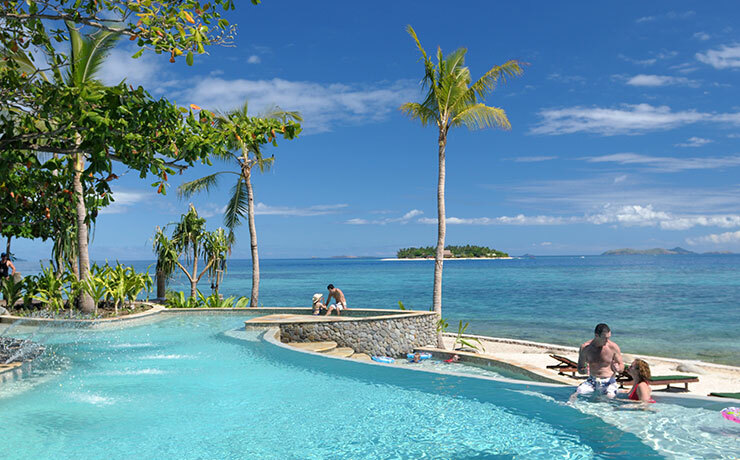 The intimate 15.5 acre island is situated 17 km from Nadi International Airport, 30 minutes from Nadi by boat or just an 8 minute helicopter or seaplane ride away, making Treasure the closest island resort to Fijis major international gateway. Thanks to our close proximity to the main island, we provide after-hours high-speed boat transfers, so that guests can be on the island the same day. Whether you're in the mood to relax or play, Treasure Island Resort offers facilities and exciting entertainment options for everyone. If you're after a swim, enjoy Treasure Islands 3 recently unveiled spectacular swimming pools designed for families, children and couples. Each pool surrounded by lush tropical gardens offers panoramic ocean views. The largest incorporates a horizon edge, as well as in-water lounging areas and water spouts to keep guests cool in the warm tropical weather. Alongside sits a freshwater pool where infants and toddlers can safely enjoy themselves while parents look on. And, set beneath the main area is a third pool, providing a quiet, romantic and secluded area for adults to relax. Guests can also enjoy an expansive menu of free water activities including, fish feeding, and snorkelling. With fishing and the collection of living shells and corals prohibited within 400 metres from the shoreline, our guests will discover an abundance of colourful marine life and coral growth surrounding the island. If thats not enough an array of other activities are on offer including coral viewing trips from our glass bottom boats, wind surfing, canoeing, kayaking, sailing, paddle boating, PADI scuba diving and motorised water sports including para-sailing, jet skiing, water skiing, knee boarding, and giant tobogganing. If you're after the ultimate indulgence, then escape to the full service health and relaxation Senikai Spa. Located within its own dedicated wellbeing bure, Senikai Spa offers a full range of health, relaxation and beauty therapies many using local Fijian ingredients. On land enjoy our complimentary classes where you will experience the true flavour of the Fijian culture. Have a go at basket and hat weaving, wood carving, Fijian language lessons, creating delicious marinades for fish, medicinal plant lessons, coconut husking and coral planting. A chapel is also located on the resort and all guests are warmly invited to attend the Christian service every Sunday at 5.30 pm. Treasure Island Resort also features mini golf, volleyball matches every evening against the staff, and a full-sized first-class tennis court with night lighting. There is also a free games room where you'll find pool tables, table tennis tables, videos and DVD movies, and a myriad of board games to keep the whole family entertained. At Treasure Island we were the first Mamanuca resort to establish a marine sanctuary in order to preserve the integrity of our surrounding reef for future generations. The marine reserve is filled with an abundance of marine and coral life including many endangered species such as the banded rail, crested iguanas, and nestling turtles. Treasures flora and fauna offers guests a unique insight to Fijis tropical eco-system. At Treasure Island a dedicated and fully-qualified environmental officer is employed to direct our sustainable tourism initiatives across the island. Part of her job is to find fun, memorable and rewarding ways for guests of all ages to enjoy hands-on experiences with local wildlife. At Treasure Island Resort there are so many facilities on offer you won't have time to find yourself bored. 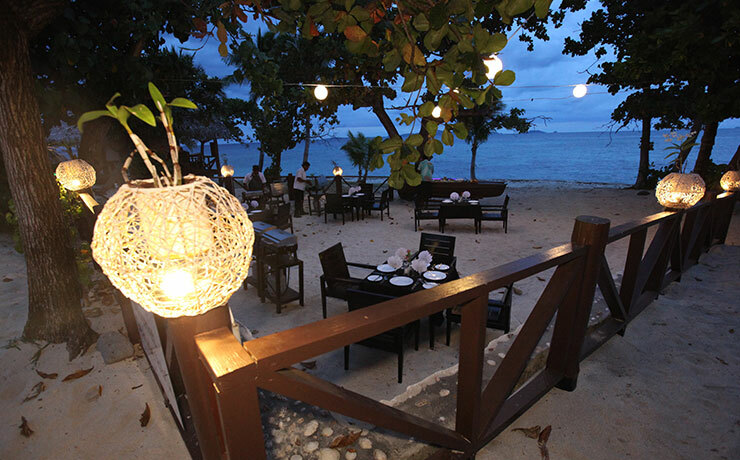 Treasure Islands guests enjoy world class cuisine in spectacular South Pacific settings. We regularly invite top international chefs, including the legendary Serge Dansereau, owner of The Bathers' Pavilion in Sydney, to work with our team to create stylish and contemporary menus using the freshest foods. Choose from our many dining locations, including our Elevuka Restaurant, Sunset Bure under candlelight, beach or poolside, or Ganilau our flamb restaurant. Here the various menus on offer include a la carte with European and local dishes, traditional lovo feast (cooked on an underground stone fire), flambe tableside cooking, international buffets and barbeque. At the Takia Bar enjoy happy hour every night from 6 - 7pm with half price drinks, and cocktail lessons and demonstrations every Wednesday and Sunday at 10.30am. Treasure Island Resort also offers a bright, nourishing and imaginative children's menu throughout the day. At 5.30 pm each evening our young guests are escorted to the very special Childrens Hour (evening meal) by our trained staff. Alternatively, you may prefer that your children join you for an adult dinner. Children under 2 years of age eat for free. If you're headed on a beach picnic or excursion to neighbouring islands just place an order for a delicious hamper brimming with lunchtime goodies, and a bottle of sparkling wine on request. Or if you're after a wonderful opportunity to save money guests at Treasure Island can also purchase meal plans prior to arrival. At Treasure Island Resort there is a dining option to perfectly cater for every island holiday. From intimate candlelight beachfront dinners to cocktail parties, live band performances, spectacular cultural shows, competitions, movies, or simply chilling out on the beachfront with a tropical cocktail, the choice is yours. As the sun sets over the Pacific in another remarkable display of colour, you are invited to join us for an evening of memorable dining, warm and attentive service, dancing and entertainment. At Treasure Island Resort there are entertainment options for every night of the week. On Monday nights enjoy a traditional Kava Yaqona ceremony, cocktail party with complimentary drinks and hors d'oeuvres, and Fijian Meke performance with traditional songs & dance. On Tuesdays dance the night away to the sounds of our resident band. Wednesdays will see you partaking in crab racing with cash prizes to be won. Thursdays will see you enjoying an international buffet theme night with a thrilling Polynesian Hula Dancing & Fire Dancing Floor Show. Friday evenings on Treasure Island are known as international night, filled with competitions. On Saturday guests enjoy the BBQ buffets, while Sundays are filled with movies in the games room and dancing and competitions until midnight. Surrounded by spectacular reef and covered with tropical gardens, all of Treasure Islands 66 traditionally-styled and bures are within 30m of the beach, and positioned for maximum privacy and unique views of the surrounding marine park. Fully air-conditioned, and also fitted with ceiling fans or the natural sea breeze, each bure is encircled by lush, tropical gardens and features a private balcony with outdoor furniture and hammock. The spacious bures are feature outdoor table sets and hammock, ceiling mounted fans, fresh water that is pumped from the mainland, tea and percolated coffee making facilities. Also included are wireless internet access (charges apply), a private ensuite offering piped hot and cold water showers, complimentary eco bathroom amenities and hair dryer, and bedding comprising crisp, high thread count linen. Non-smoking bures are also available on request. Interconnecting bures are available for large families and friends travelling together. Island Bures feature a lush, tropical garden setting within easy 30-metre access of the beach. This accommodation is located within a group of four adjoining bures, and sleeps three adults or two adults/two children (2-11 years of age). Bedding includes one king, one single, and one rollaway (complimentary upon request for child 2-11 years). One cot is also available free of charge for infant up to 23 months. Island Bures feature 38m? interiors and wireless internet access (charges apply). Interconnecting rooms available. Oceanview Bures offer superb ocean views from your guestroom, and accommodate three adults or two adults/two children (2-11 years of age). Bedding includes one king, one single, and one rollaway (complimentary upon request for child 2-11 years). One cot is also available free of charge for infant up to 23 months. Oceanview Bures feature 38m? interiors and wireless internet access (charges apply). Interconnecting rooms available. Beachfront Bures offer absolute beachfront positions and sleep three adults or two adults/two children (2-11 years of age). Bedding includes one king, one single, and one rollaway (complimentary upon request for child 2-11 years). One cot is also available free of charge for infant up to 23 months. Beachfront Bures feature 38m? interiors and wireless internet access (charges apply). Interconnecting rooms available. There is no charge for 2 children under 12 yrs of age sharing the same room with their parents. This applies to accommodation only and does not include other resort facilities and services such as food, beverage, motorised water sports etc. Child Meal policy. Children less than 3 yrs of age Free. Children's meal package for dinner is available only between 5.30pm -6.30 pm. For children's meals outside children's dinner time, half portion at half price off A La Carte menu. Don't plan on spending too much time with your kids because they will simply love the complimentary kids club. A Treasure Island holiday provides tired parents with a much needed rest, and excited kids with a chance for endless fun while learning about Fijian culture and exploring our unique environment. The club is centred around a large purpose-built bur strategically located in the centre of the island, away from the main entertainment area for adults. Treasure Islands youngest guests (3 years and over) enjoy an unforgettable hands-on experience of Fijian culture. Children help care for the islands endangered Hawksbill turtles, feed Hibiscus flowers to the island's rare Crested Iguanas, 'plant' new coral and help re-populate the island's surrounding reef with important marine species, including giant clams and triton snails. There are plenty of other activities to keep kids stimulated and entertained, including sports, dancing, treasure hunts, competitions and games. Once a week the resort has a Fiji Day when kids get to create their own Lovo (traditional feast). As part of the activities the children prepare the food, weave dishes from coconut leaves and cook the food underground. Then, in the evening, they put on local dress and present a Meke (a performance of Fijian songs and dances) to parents. Kids on Treasure Island can also make friends with some local children when, once a week, the Kids Club, travels on a 15 minute boat trip across to Viti Levu to experience a typical day in a local Fijian village school. our Senikai full service beauty and health spa and much, much more. Its all part of the unforgettable experience that is Treasure Island. 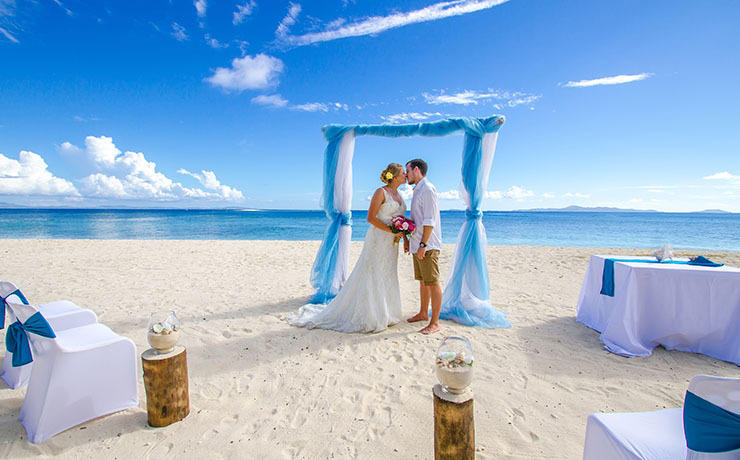 Treasure Island is one of the most romantic destinations in the South Pacific and our experienced staff are experts at creating moving and memorable marriage ceremonies. You'll find all the essential ingredients for the perfect romantic escape right here on Treasure Island. 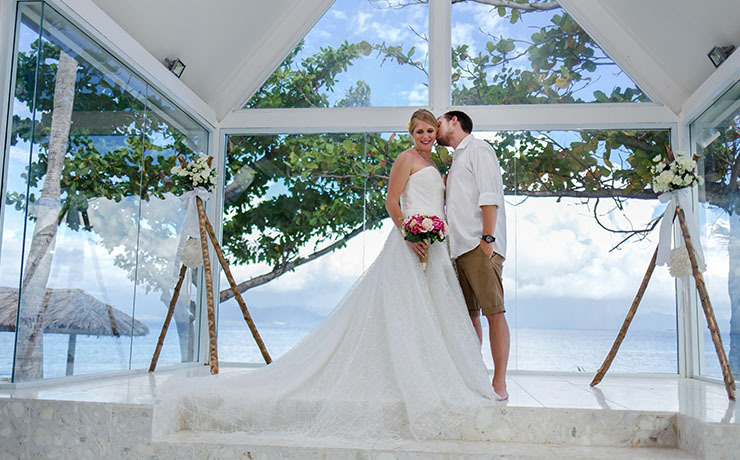 A wealth of options are available including sunset, sunrise or daytime ceremonies, exquisite locations overlooking the ocean, poolside or pagoda ceremonies, or taking your vows in the exquisite island chapel. For those after a more formal touch, the masterfully designed glass and marble (non-denominational) Sigavou Chapel on the east beach offers panoramic ocean views. Your perfect wedding is made easy at Treasure Island Resort with professional staff who can arrange your wedding package. Your package may include options such as stunning bouquets and flowers, champagne, wedding cake, Fijian wedding costume, singers and/or entertainment, professional photographer, video coverage, Fijian warriors in costume, 10 member Fijian choir, hairdresser and/or masseurs, transfer by decorated boat around the Island, and a wedding celebration beach banquet. Get away from the crowds to one of Fiji's many islands - after all, isn't a holiday all about giving yourself some extra special treatment? Make an occasion of it and head out into Mamanuca, Yasawa or Northern Islands, where you'll find resorts that are simply divine. These quiet escapes are full of all the sun, sand and surf that you could dream of, not to mention plenty of adorable ocean animals like turtles and fish that are dead-ringers for Nemo himself. Best of all, you can hide away from any worries of 'real life' and surrender to the laid-back charm of island life. For a family-friendly experience head to a resort on the Mamanucas, where cheerful smiles, relaxed attitudes and heaps of beachfront fun are all part of the package. Think rejuvenating spa treatments while your little ones are kept busy at the kids' club, or spending days on the beachfront enjoying classic activities such as sandcastle building, swimming and snorkelling. There's always a delicious meal at the resort's fine dining restaurant for when you make it back! The Yasawa and Northern Islands are home to a number of luxurious resorts, perfect for those looking for that celeb treatment. However, there are some more budget options here too, for those seeking a good deal on paradise. It's only fair that anyone and everyone can enjoy the beauty and luxury these islands provide. Couples on a honeymoon or looking for some solace might want to take refuge in an adults-only resort, while anyone can enjoy bure-style beachfront accommodation. Resorts also range from small and boutique to large and commercially-operated, so you can choose the style that suits you best. We can help you find the perfect island resort, so don't delay in booking that holiday leave! Conditions: Wedding package prices are valid for travel until 31st March 2020. **AUD prices are subject to currency changes. All guests must stay on Treasure Island; A 20% non-refundable deposit is required upon confirmation of your wedding arrangements; other special booking and payment conditions apply; international flights, vehicle and boat transfers are not included. Menus may vary due to seasonal produce changes. Beverages include house wines, local beers and soft drinks (reception for the Matavuvale package). BSR AUD 1.51. Extra person rate for the reception dinner is FJD$211 (AUD$140) per person. Beach wedding set up FJD$365 (AUD$240). Other menu and beverage package options are available on request. for further information please enquire today.